OECD, Education at a Glance. chart 21.01 and table 21.03 as well as chart 21.02 for France are based on the INSEE Employment surveys. chart 21.01 relates to the rate of higher education graduates. It is fed by statements from those surveyed, grouped by five-year age groups (age on the date of the survey). The base used is the 2013 employment survey. These qualifications may have been obtained in initial education or by resuming studies. The DEUG (2-year university degree), which has gradually ceased to be awarded with the introduction of the LMD reform, has been considered as a long-cycle higher education qualification. chart 21.02 relates to 'initial education leavers', the end of initial education corresponding to the first interruption of studies of over a year. The data on 'leavers in year n' is collected the following year (survey 'n + 1'), which means that the qualifications have been acquired in initial education and not by resuming studies. They are grouped into three years of initial education leavers (and therefore three years of surveys) in order to obtain samples of sufficient size. Each year, the percentage of an age group that obtains a higher education qualification is calculated using statistics on qualifications for the year's session and the population data for that year. This LOLF indicator is obtained by calculating, for each age, the ratio of the number of people of that age who hold higher education qualifications to the population of that age, and then calculating the sum of these percentages for each age. In France, young people are more likely to have higher education qualifications than older people, and also more likely than young people living in other OECD countries. In the early 2010s, 44% of young people leaving initial education were awarded higher education qualifications. Several indicators can be used to measure the proportion of young people who have been awarded a higher education qualification, compare it to the total population, compare with other countries and analyse recent developments. The proportion of higher education qualifications in the French population aged 25-64 was within the average for OECD countries in 2013 (chart 21.01). 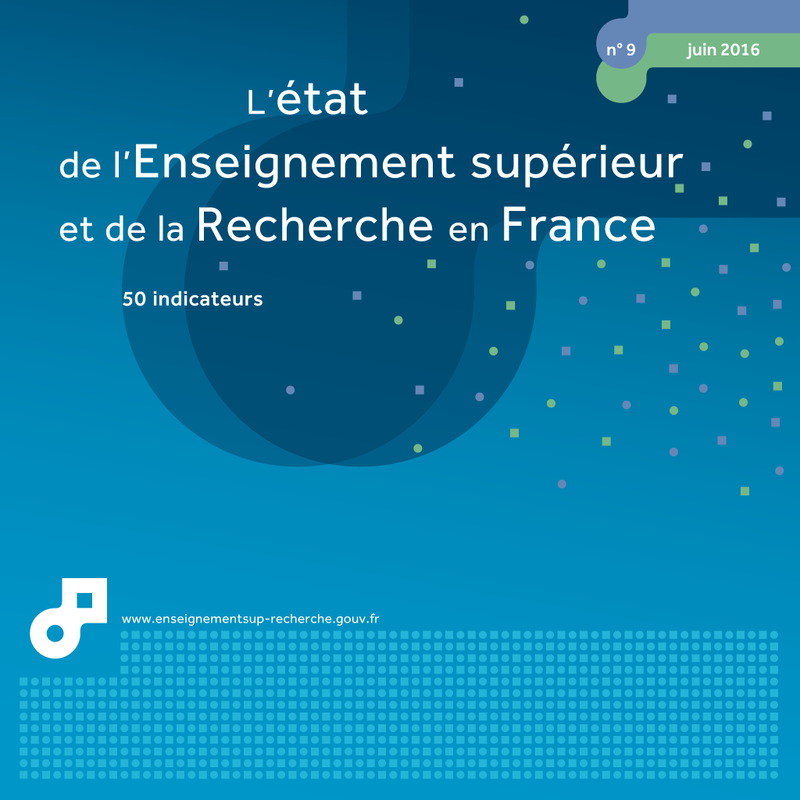 Secondary and higher education were less developed in France than in Europe or North America, at the time when the generation that is now 60 was at school. However, thanks to the extension of education and significant developments in student numbers in the 1990s, the younger age bands have more higher education qualifications. The proportion of young people aged 25-34 with a higher education qualification in France is higher than the average of OECD countries. Short-cycle vocational qualifications are well represented (ranked 4th for 25-34 year olds), long-cycle qualifications less so (ranked 21st at the same age). In order to promote a society of knowledge, the European Union aim is for at least 40% of young adults aged 30-34 in its territory to have a higher education qualification by 2020 (38% in 2014). France has achieved this objective (44%). A comparable proportion of young people aged 25-29 has a higher education qualification (chart 21.02): 30% have a long-cycle qualification (Bachelor's or higher degree) and 15% have a short-cycle, vocational qualification (BTS, DUT or paramedical and social work diploma). This rate is very similar to that of people aged 30-34 or 35-39, but much higher than the figures for older people. A second indicator, focused on initial education, helps to understand at national level the qualifications obtained by young people recently leaving initial education: it measures the proportion, among leavers, of young people with higher education qualifications. This proportion is 44% for young people who left in 2011-2013: 29% of young people had taken long-cycle qualifications while 15% of young people had taken short-cycle vocational qualifications (table 21.03). The share of young people with higher education qualifications is slightly up for the period 2011-2013 compared to 2008-2010. With the development of the new ‘Bachelor’s Degree, Master’s and PhD’ (Licence Master Doctorat - LMD) system, the most recent graduates are further continuing their studies and 18% of them are achieving qualifications at Master's level (including engineering and business schools), compared to 14% three years previously. Among initial education leavers, some Bac holders undertake higher education without obtaining a qualification (table 21.03). This is the case for around 75,000 young people, or 20% of higher education leavers, a proportion lower than the OECD average (32% in 2011). In addition, 41% of young people leaving the education system have at the most one second-cycle secondary education qualification and 15% a school leaving certificate or no qualifications. Finally, a third national indicator aims to take account of the most recent developments concerning access to higher education qualifications. It is constructed in a given year by aggregating, at each age, the proportion of young people of that age who obtain an initial higher education qualification. This is the indicator used for the LOLF (French Organic Law on Finance Laws), with a target of 50%. It was 45.9% in 2012. It is slightly increasing and higher than previous indicators, and would seem to represent a recent rise in the access rate to higher education qualifications. Extract from the chapter "21. level of education among the general population and among young people". In 2014, 45% of young people aged 25-29 said they had a higher education qualification compared to 21% of people aged 60-64. On average, 44% of those leaving initial education in 2010, 2011 and 2012 graduated with higher education qualifications, compared to an average of 41% in 2008, 2009 and 2010. Scope: household population in metropilitan France, young people leaving initial education the year preceding the survey.